I had an urgent craving for chiffon cake for a while. A friend of mine had been making the cakes every so often and posting their pictures on her blog, and every time I saw one I got increasingly obsessed with the idea of making one myself. 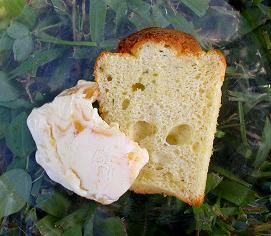 I also wanted to use up fresh herbs that I had bought a while ago - I had already made herb oil, herb vinegar, herb salt, besides using in roasing and grilling - and remembered that I had a recipe for herb chiffon cake. Bingo. The problem was, I didn't own a chiffon cake pan. Over here it is sold under a more common name, namely angel food cake pan, but either way I could only find a non-stick one (and I would want non non-stick pan for this particular kind of cake, as it is supposed to be cooled down upside down, and the pan needs to hold the cake so that it wouldn't fall off), so I decided to try and make the cake in paper cups - not those thin ones for regular cup cakes, but for drinks. This was an idea I found in more than one resources, so it seemed to be fine. The recipe I was going to use was from an old cookbook that I bought like 15 years ago, and I also consulted several different recipe sites on the net. Although there was a variety of slightly different recipes, the one in my mind was a pretty basic recipe for plain chiffon cake, I thought. It called for three herbs - rosemary, thyme, and basil. As I had happened to find lemon basil at the farmers' market the other day, I used them in place of regular Italian basil and I added zest and juice of a lime. The lime was also from the same vendor at the farmers' market was a bit strange one that had a bit ugly look yet bright orangy pulp, and did have a hint of orange taste (later a friend of mine suggested that it might have been kaffir lime, and that might have been it). Chiffon cakes are made using vegetable oil, and this time my choice of oil was extra virgin olive oil - I had been sometime successful and other times not quite so in using olive oil in cakes, but I gave it a try anyways. The combination of herbs and lime somehow sounded as if they should go well with olive oil. I tried to beat the egg yolk mixture and the egg white stiffly, and work as quick as I could so that the form wouldn't loose its air. Reducing the ingredients to half (using 2 yolks and 3 whites), it yielded 5 cups of cakes. After 25 minutes of baking the cakes came out of the oven golden brown and risen proudly all the way up to the edge of the cups. I put them on a wire rack upside down and let cool. The last challenge in making chiffon cake might be to remove the cake from the pan; I have heard so many stories of sadly lost games of removing the chiffon cake intact. But in my case, this wasn't an issue because all I needed to do is just tearing the paper cup break, and the cakes came out no problem. The texture of chiffon cake - light, fluffy, airly - is something you don't get to have from other kinds of cakes, and I realized how I had missed it for so long. My cakes tasted more of lime than herbs (I should have put more herbs), but were very refreshing and tasty nevertheless. Olive oil, although it had seemed to be overpowering while I was making the batter, turned out to have worked pretty well with this one. Although I served a slice with a scoop of ice cream once, I liked the cake better just as is. 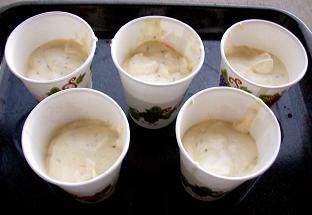 Now I got a taste of success, I will be making more and more chiffon cakes - in paper cups! What a novel idea you came up with. 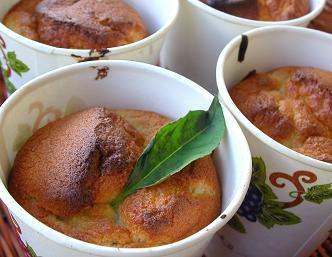 I would have never thought to bake chiffon cake in paper cups. Were these cups waxed? And weren't you afraid they were going to burn in the oven? I'm not sure that the lime you have there is kaffir, it looks more like kalamansi if you ask me. Does the lime have a slightly sweet flavor? I'd love to try this! Would you share the recipe, when you have a moment and if it's not too much trouble? Reid - Actually it wasn't my idea to bake chiffon cake in paper cups, there were several cookbooks/recipe sites that employ this method. So I made it a go although I had sure wondered if the cups burn in the oven... and they didn't (thank god). I sm sure the cups are waxed outside, but I think they aren't inside. Although I am not 100% happy about using waxed cups, I think it should be okay since the very surface of the cake will be peeled off as I tear off the cup, or so I hoped... you can sure use regular paper cups for cup cakes, but for this cake you want something deep enough to hold the rising cake, you know. i haven't made cakes in paper cups since i was a little kid! 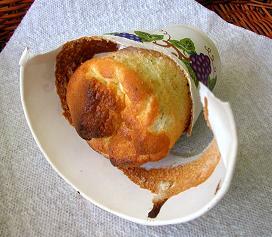 but they *definitely* weren't as beautifully sophisticated as herbed chiffon cakes. there is a chance that what you have is not a calamansi (or kalamansi), but a type of dalandan, which is a close relative. i cannot gauge the size or thickness of skin from the photo, so i assume it could be either. 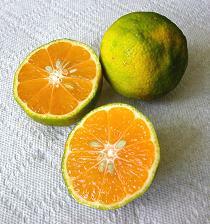 dalandan is a sour orange, related to kunenbo in japan. well I guess silicon pans are better, aren't they? Dalandan? Another unfamiliar name... kunenbo is a very old type of mikan (satsuma), I believe, so that could be the one, too... I really should go back to the market and ask them what they really are. !!! i'm not sure where i stand with silicone pans. i like them, but i'm not sure that the cost outweighs the need (how many times a year am i going to make funny fluted pastry? ), esp. if i can make do with whatever's around the house, and doubly so if it's recycled. but i can't deny silicone's practicality and durability. in pans, anyway.